We carry polarized eyeglass lenses and sunglasses and Transitions® photochromic lenses. 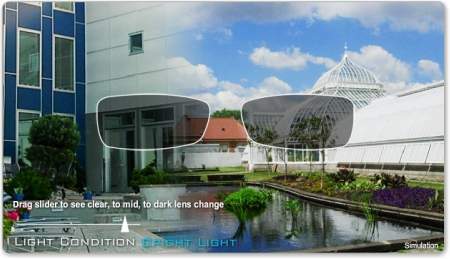 Photochromic or light-sensitive lenses change continually based on the amount of UV light absorbed by a transparent layer on the surface of photochromic lenses. Without UV light, the lenses are clear. In UV light, lenses darken. Transitions lenses are ideal if you want to use one pair of glasses both indoors and outdoors. We recommend Transitions if you want versatile indoor and outdoor glasses. We can also combine Transitions with other types of lenses like Varilux progressive lenses. Polarized eyeglass and sunglass lenses are design to cut the glare that comes from reflected light. Most of us notice it when driving or on hazy days. Polarized lenses cut this glare because they filter light that enters at certain angles. View an instant demonstration of Transitions® photochromic technology. See how lenses darken and fade back to clear to provide continual visual comfort and protection. Interactive demonstration of Transitions® lenses and demo in different environments.